I opted for an overnight bus from Nice – a good €100 cheaper than the train and the bus was the same price as a night in a hostel. It was soul destroying – just over 13 and a half hours long. In one way, sitting on my arse and doing nothing for that long at one time kind of does sound like something I do on a regular basis, but not confined to a bus seat. 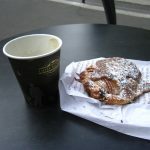 At 10am, once I’d checked into the hostel I decided that I wasn’t messing around and had a big coffee to hopefully make up for the lack of sleep and a pan au choc aux almandes. I’ve had a few crossaints and things that resemble them, and this was one of the best. 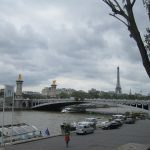 As I was staying near the Sacre Coeur I headed there, before going to the Eiffel Tower, Arc de Triomphe and the Louvre. I didn’t go in any of them as I was shattered but made plans to visit them later on. 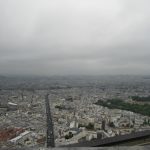 Thursday, I was planning to go up the Arc de Triomphe but instead went up the Montparnasse Skyscraper – I remembered seeing it on Travel Man on channel 4. I’ve received comments about how all the pictures I post on Facebook always have bad weather in the background, and this is no different. Up the top of the skyscraper was far less people than I remember whilst up the Arc de Triomphe ten years or so ago, and also had an indoor viewing point. One of the things that I like about Paris is that you can just walk around aimlessly and see things, so I ended up walking back into the center on a mission to find a bakery. I found one with a queue going outside whilst it was raining, so I went inside and by miracle found a seat. 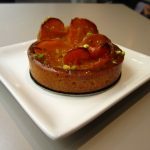 There was the standard French stuff like éclairs, tarte citron and chocolate tarts which I’ve had before so I pushed the boat out and had an apricot and pistachio tart which was bloody good. 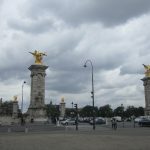 After I walked up the road to the Louvre. Being under 25 and (somehow) having a UK driving license, I got in for free which was handy because I didn’t like the place – too many people. 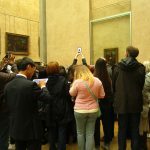 One of the things that I had wanted to see was not the Mona Lisa, but the crowd around it – I’ve seen quite a few pictures of the crowd around it, I’ve seen pictures with at least twice the amount of people, but I do not understand the fascination with it. 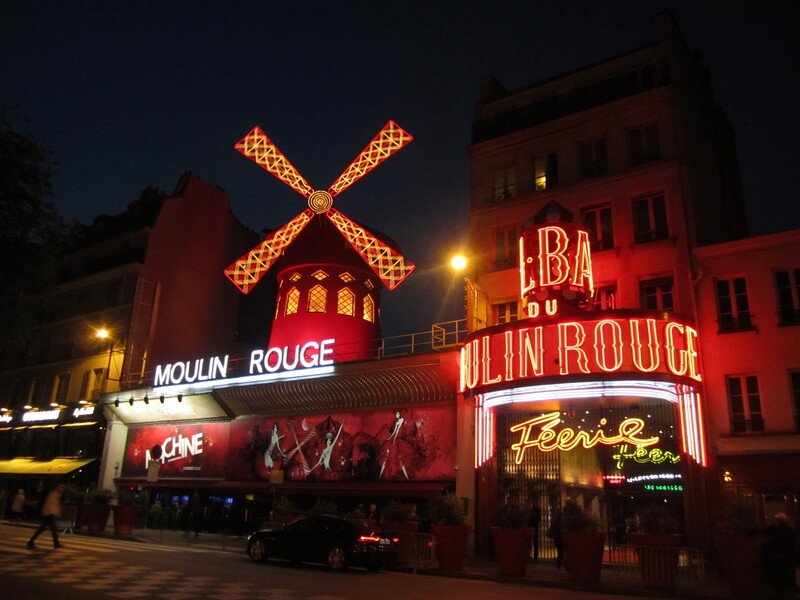 In the evening I headed towards Moulin Rouge to see it lit up. 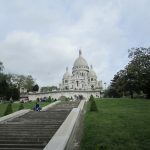 I was also going to go up the stairs to the Sacre Coeur but the amount of creepy men trying to get my attention on the way to/from the Moulin Rouge put me off. On Friday I headed to the Pompideu gallery. It didn’t open until 11 and recently I’ve gotten into the habit of leaving the hostel by 10, so I was half hour or so early. 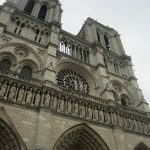 Instead if waiting for it to open, I tried to find the Notre Dame cathedral. 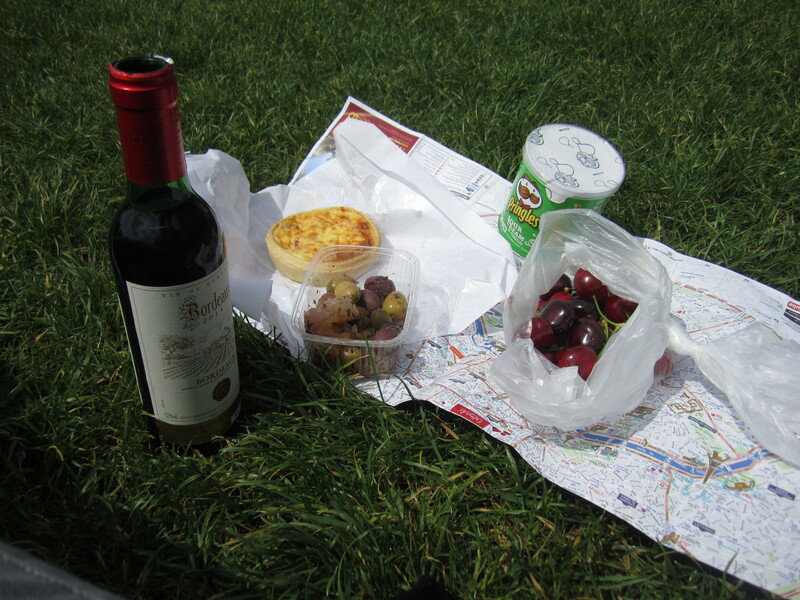 I went the wrong way but stumbled upon some really good looking French delis with quiches, terrines etc in and as I was planning to have a wine fuelled picnic on Saturday, I think I found the place where I’d buy the food for it. Once I headed in the right direction to Notre Dame, it started raining so I went back to the Pompideu for a bit. 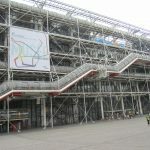 Like the Louvre, I got free admission to part of the gallery which I enjoyed. After, I tried to find a good bakery but it seems that I can only find them when I’m not looking for them. I went back to the hostel after a croque monsieur; there’s a place on the corner of the road that sells the nicest looking pastries. 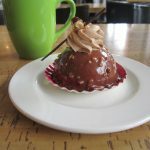 I went for a chocolate mousse with hazelnut and caramel, coated with chocolate and it was awesome. For a couple of hours I chilled out in the hostel, before having dinner with someone I met in Pompeii then met up with in Rome. It was a pretty good meal and was nice not to cook dinner for the first time in a while. I didn’t post an entry about Nice as I have no pictures, but last week I met up with someone I spent time with in Prague and Budapest. We ended up hiring bike and having a picnic on the beach, so today I repeated that with the exception of having some company and thankfully not having to cycle. 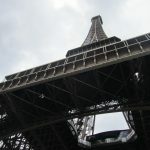 This time I bought a quiche and some olives from a deli, some cheese, wine, cherries, and I couldn’t resist the pringles, then went to the Eiffel Tower. I had to have a lay down after the wine, and then came back to the hostel via a bakery as I wanted to try some choux pastry. I’ve eaten so many pastries over the past few days that I’m kind of surprised that Jamie Oliver hasn’t come here to lecture me about the amount of sugar that I’ve eaten. Overall, I really enjoyed Paris. I didn’t really know what I was going to make of it; I thought I would’ve associated it with my GCSE French and not really be a fan, but I proved myself wrong. 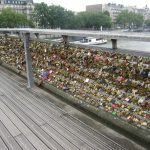 I lived in France for five months a couple of years ago and used more of the language over the five days, which was nice to do after so long abroard having to rely on people knowing English. It’s also been nice to travel properly again after I left Budapest, as I feel as though most places I’ve visited since I’ve not been to fussed about.